On March 29, British Prime Minister Theresa May signed a letter declaring the United Kingdom’s intention to invoke Article 50 of the Treaty on European Union and withdraw from the EU. Going against most mainstream predictions, Geopolitical Futures believes that Brexit will not have a dramatic impact on the U.K. economy for two reasons: the country’s shifting economic structure and its decreased dependence on the EU market. We conclude that continental Europe (particularly Germany) needs the U.K. as a trading partner more than the U.K. needs continental Europe. We predict that this reality will lead to an agreement between the EU and the U.K. to maintain an easy flow of trade. At the same time, we predict that the U.K. will continue to increase its trade with fellow Commonwealth of Nations countries while also investing in its strategic relationship with the United States. The U.K. joined the EU after losing its empire, a time when it needed new markets for its exports. Britain’s EU membership led to changes in the country’s economic structure. Since the 1980s, the British economy has become increasingly dependent on its services sector while the importance of industry, in particular manufacturing, has diminished. 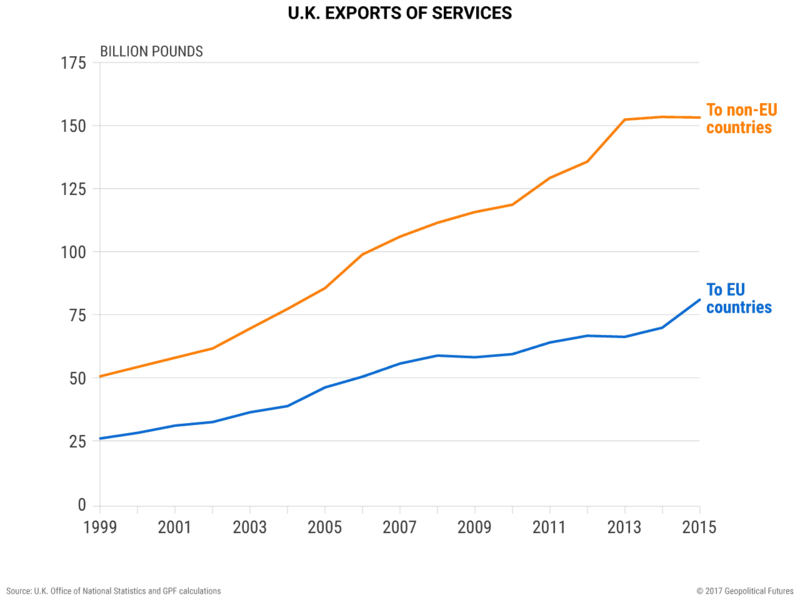 The U.K. is the second largest exporter of services in the world after the U.S., and U.K. service exports to non-EU markets have exceeded those to the EU since before the 2008 economic crisis. 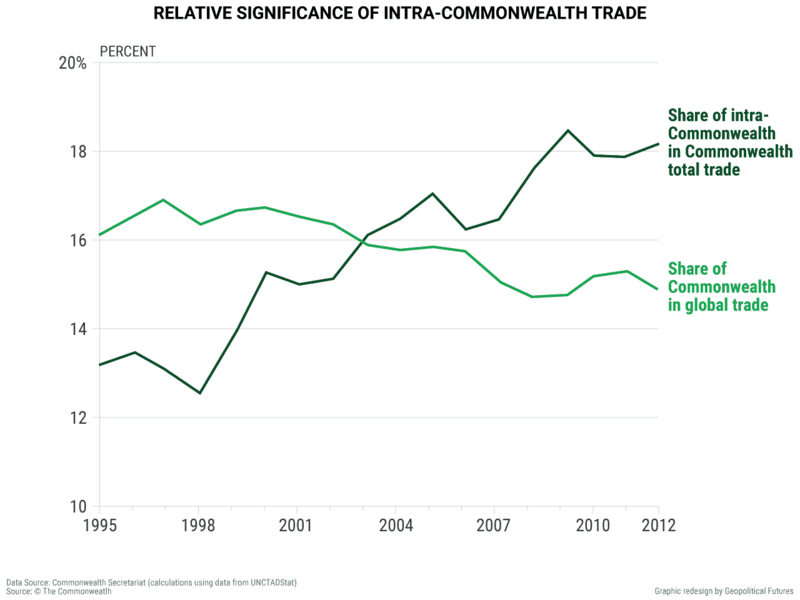 Although the British Empire is gone, historical links still exist, and the U.K.’s exports to other Commonwealth countries have grown as intra-Commonwealth trade has outpaced Commonwealth countries’ trade with the rest of the world. The U.K.-U.S. relationship remains paramount for London because the U.S. is Britain’s primary market and the U.K. needs the U.S. to secure its exit strategy from the EU as it seeks new markets worldwide. Brexit has raised questions about the United Kingdom’s trade relationships with the rest of the world. Most predictions have been negative since it is expected that the U.K. will lose access to the EU common market as a result. However, when examining U.K. trade patterns over the last decade, we have observed that U.K.-EU trade has diminished and Britain has become more reliant on other, more distant trade partners. This process happened naturally as the U.K.’s economic needs changed, and it accelerated following the 2008 economic crisis. While the U.K. runs a negative trade balance with continental Europe (it imports more than it exports), it has increased its positive balance with rich economies that include the U.S. and a number of Commonwealth markets. The British strategy regarding Brexit highlights the classic case of a nation waiting, watching and keeping its options open. This is just another example of Britain’s adaptation to the current global environment. The British Empire was a trading empire, and the United Kingdom holds trade at its core. Once the U.K. lost its empire and as Europe became more united, Britain grew interested in joining the European Union, which promised new markets for British goods. But as the British economy changed its structure and the 2008 crisis slowed European consumption, the U.K. once again shifted its attention from the European market to the global market. Before World War II, the British Empire controlled about a fourth of the world’s land surface and a fifth of the global population. Britain was the global power controlling trade routes in the Atlantic and also in the Indian and Pacific oceans. This helped Britain emerge as the dominant economic power in the 19th century while also leading the Industrial Revolution in Europe. The British Empire was a trading bloc. Its manufacturing industry was supported by raw materials supplied from abroad while its industrial output was absorbed by world markets, including its colonies, using the trade routes the empire had secured. The British Empire reached its peak in 1815, when Britain was the European power that possessed the most land in the world and was strong in both the Atlantic and Indian oceans. Britain had no European challenger until Germany became a dynamic European continental power capable of both efficient production and trade. This happened after Germany’s 1871 unification provided the framework for the country to develop into a continental power. The end of the 19th century saw the U.K. gradually lose its European primacy in the face of German competition. But it wasn’t until Germany’s defeat in World War II that Britain lost its global dominance to the United States. Following WWII, the U.S. became the world’s major global military and economic power – in large part due to war-driven industrial production that was accompanied by minimal attacks on its own territory. During WWII, the U.S. prevented Germany from coming out of the war as a stronger economic power, saving Britain from having to submit to Germany’s will. Instead, the U.K. ended the war being militarily dependent on the U.S. and having a weakened economy. After WWII, it was the U.S. (rather than the U.K.) that secured global trade routes. The U.K. became a strategic ally for the United States. Both nations shared an interest in keeping the naval routes secure. For the U.S., with both the Atlantic and the Pacific on its borders, the interest was dictated by geography; for the U.K., the interest was dictated by international trade. Knowing its limitations and imperatives, London’s goal since the end of WWII has been to maintain a degree of influence over U.S. policy. The U.K. became a special ally under the U.S.-dominated alliance system because it understood that the U.S. wanted a country with which to share the military burden when engaging in global or regional warfare. The U.K.’s military resources exceeded those of other European countries, and the U.K. was more willing to use them for the U.S. since doing so coincided with securing its own interests. At the same time, losing the empire meant that the U.K. needed to shift the focus of its trade strategy. As European countries grew more united and rebuilt their economies after WWII, the U.K. saw an opportunity. It realized that the common market taking shape on continental Europe could supplement – if not replace – the U.K.’s decreasing imperial/colonial markets. It should be noted that the French were initially unenthusiastic about the U.K.’s membership in the European Union. French President Charles de Gaulle rejected the idea in 1963, viewing the U.K. as nothing more than a Trojan horse of the United States. France, which dominated the EU at the time (much like Germany dominates today), understood that the U.K. would never be submissive to a continental European country, and its objection prevented the U.K. from joining. Furthermore, the U.K. was only admitted to the European free trade area in 1964. However, de Gaulle’s successor, Georges Pompidou, removed French opposition, and the U.K. became a member of the EU in 1973, holding a national referendum that confirmed the British government’s political decision. Upon joining the EU, the U.K. changed its economic structure because it had to respond to different market needs. 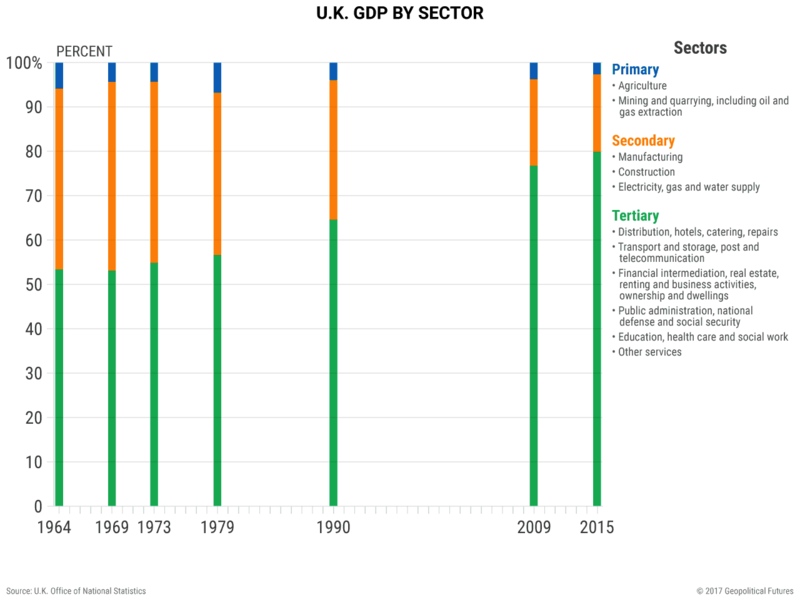 Three sectors define the structure of the British economy. The primary sector includes activities that relate to natural resources, such as agriculture or mining. The secondary sector includes all goods produced by the industrial sector, which has manufacturing at its core. The tertiary sector includes services such as banking and finance, insurance, distribution, transportation, health care and others – all services that support the primary and secondary sectors. During the industrial revolution and the empire’s golden years, the primary sector sustained the growth of the secondary sector, while the tertiary sector was negligible in size. From the beginning of the 20th century until WWII, the secondary sector became the most important component of the British economy. Once the U.K. gained access to the EU free trade area in the mid-1960s and became a member of the EU in 1973, its economic structure changed so that the tertiary sector, services, is now the most important. To understand how services became the most important part of the U.K. economy, we examined the evolution of each of the country’s economic sectors in relation to the U.K.’s integration into the EU. The importance of the primary sector – agriculture and mining, which were at the core of the British economy before WWII – has significantly decreased since the U.K. joined the EU. According to the Office for National Statistics, agriculture comprised about 0.6 percent of GDP in 2015, dropping from 2.9 percent in the early 1970s when subsidies from Brussels flowed in. At that time, access to European funding led to superficial short-term growth in the agriculture sector since growth was dependent on subsidies rather than being driven by the market. This created the foundation for further inefficiencies – subsidies, from both the EU and the British government, fed the agriculture sector without helping to reform it. Mining dropped to 2 percent of GDP in 2015 due to a combination of lowered industrial production and EU clean energy efficiency policies and regulations, after peaking at 4.5 percent in the 1980s, when oil and gas extraction led to a growth trend within the sector. Manufacturing, which was once at the core of industrial growth, saw a relative rise during the first years of EU membership as British producers adapted their output to the new market. Since the mid-1970s, however, it has been on a downward trend. Manufacturing currently accounts for 10 percent of GDP but comprised 30 percent of GDP in the ’70s. While access to the EU market was granted, the U.K. had less and less incentive to participate in trade with other EU nations. There were a number of non-tariff barriers related to continental Europe’s production standards and, later on, barriers stemming from use of the common euro currency, all of which diminished the U.K.’s appetite for innovating to sell on the EU market. This has resulted in the British economy’s deindustrialization and an increased specialization in services. The services sector has seen constant growth since the 1960s. Finances and banking, distribution, insurance, transportation and other services currently account for more than 75 percent of GDP, and their export share is 12 percent. This tertiary sector of the U.K. economy has developed around both opportunity and innovation. For instance, London benefited from opportunities that resulted from geographical advantages. The former empire understood risks related to trade routes, so it could easily develop transportation, distribution or insurance services. Furthermore, London was already an exchange market and a key financial hub, so innovation in financial services was natural. It had also laid the groundwork for innovation since human capital was abundant, considering Britain’s demographics, and was also driven by an immigration policy that aimed to attract talent from all over the world. The structural changes associated with deindustrialization have had a high impact on the British employment map; consequently, they have exacerbated the existing north-south divide. While the southern U.K., which is more urban, contains the wealthy financial and technological industries, northern England and Scotland have seen poor economic performance over the years due to their traditional industrial roots. According to the Office of National Statistics, 1.4 percent of the labor force was employed in agriculture in 2016, 18.2 percent in industry and 80.4 percent in services. This, more than the geographic divide, creates a challenge for the British government. London politicians listen to their electorate, which, in turn, depends on how the economy is doing. Considering that services account for such a large portion of GDP and are the U.K.’s main export, London will have to find ways to maintain a growth environment for this particular economic sector. Since 2008, global trade has slowed as nationalism and protectionism have grown. At the same time, trade structures around the world have changed during the last decade; for the first time, trade in services has grown faster worldwide than trade in goods. The British economic structure allowed the U.K. to not only keep pace with this global trend but also be among the leading service exporters. With services accounting for 44 percent of the country’s exports in 2016 compared to 38 percent in 2006, the U.K. is the second largest exporter of services in the world. (The U.S. is the largest.) Trade in services faces fewer barriers than trade in goods because services are naturally more universal; they require only minimal adaptation to meet changing national standards. At their core, for example, financial services in Slovenia are similar to those in France. So are transportation or postal services. Therefore, services are more transferable to other markets than physical goods are. Brexit will have little effect on the U.K.’s service exports. While an agreement is likely to accommodate continued U.K. trade with continental Europe, the U.K. has already shifted its focus away from continental European markets, and British service exports to non-EU countries outpaced service exports to the EU beginning in 2005. This shows that in the case of British services, business opportunity was the U.K.’s motivator to move away from continental Europe as a trade partner. This is in contrast to the goods market, where the U.K. began to search for new markets as a result of the 2008 global crisis. 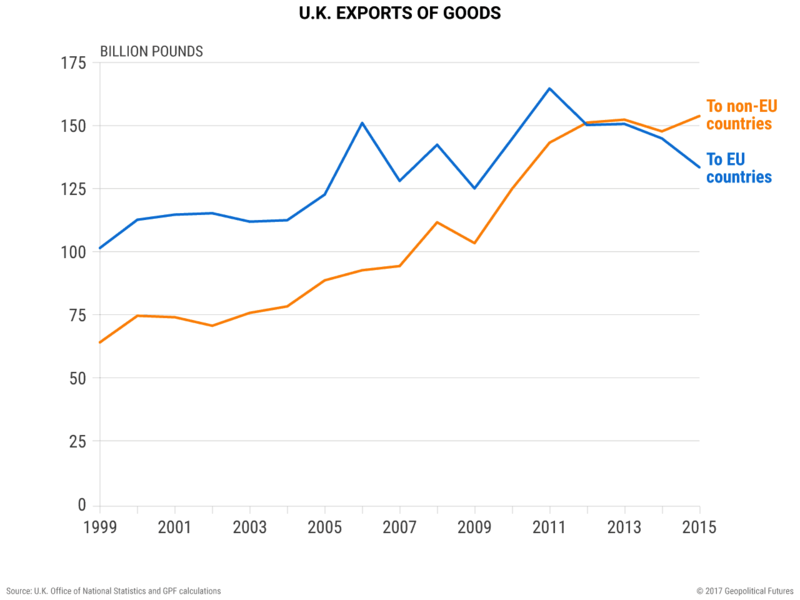 British exports – in both goods and services – began their stagnation in the early 2000s, mostly due to the mechanics of U.K.-continental EU trade. U.K. companies exporting to the EU use complex supply chains that diminish their competitive advantage. Additionally, most British exports go to several EU countries that are also members of the eurozone. (The U.K. is not a member.) The creation of a common currency area made it easy for member countries to trade with one another while posing a non-tariff barrier to non-eurozone countries. This has increased the level of integration among eurozone economies, which have used the euro to create a cost advantage for their own exports. However, this has had a negative effect on U.K.-EU trade relations. Following the 2008 crisis, the integration of eurozone economies showed its vulnerabilities. Taking into account that eurozone consumption has dropped since 2008 while financial and socio-economic distress has increased, eurozone countries prefer to trade with non-eurozone markets with which they have limited integration – and therefore less contagion risk. This makes Germany more interested in the British market than vice versa. While the eurozone has to deal with questions surrounding the future of its common currency, this has never been a concern for the U.K. Still, the hurdles of trading with eurozone members caused British exporters to look for other markets even before the 2008 crisis. This prepared them for the post-2008 drop in continental European consumption. By then, British companies had already increased their exports to non-EU markets and continued to do so. Because of this, it’s likely that Brexit will not have a dramatic impact on the U.K.’s economy. Since 2008, British trade relations have been defined by the growth of services and the increased role of the Commonwealth. 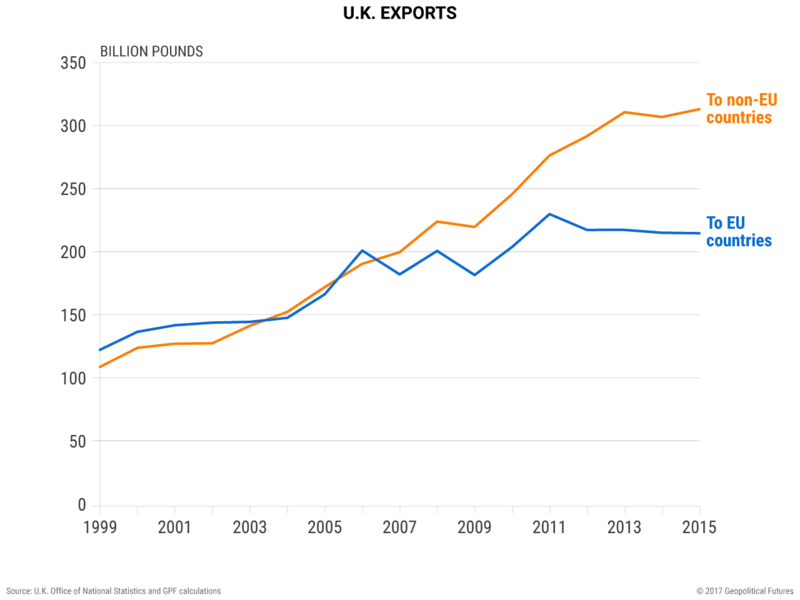 U.K. exports to the U.S. and Canada have been growing since 2000, a trend that has been maintained even following the 2008 crisis, which caused a significant deceleration in EU consumption. The U.S. and Canada received about 20 percent of total British exports in 2016, and the U.K. has increased its positive balance with the U.S. over the last decade. Both U.S. and Canadian markets are accessible for the U.K., considering the countries’ historical ties, common business culture, language and geography. Moreover, exports to Australia have also increased since 2007 along with exports to New Zealand, India and South Africa. These countries are all members of the Commonwealth. The U.K. has a positive trade balance in exports with all of them, except India. The U.K. is integrated with India on a different level. India exports more services to the U.K. than it imports, but Indian-exported services often become inputs for British services that are later exported. While the U.K. is shifting its economic focus back to the Commonwealth, it is not the only country doing so. According to the latest report by the Commonwealth Secretariat, intra- Commonwealth trade has not only grown but has outpaced the group’s trade with the rest of the world. At the same time, trade in services between Commonwealth nations has grown faster than trade in goods has grown. The U.K. is the top exporter of services in the Commonwealth and the fourth largest exporter of goods, so this has been beneficial to the U.K. Statistics from the last decade confirm that while looking for alternative markets to those of continental Europe, which has become increasingly difficult for Britain to penetrate, the U.K. has naturally turned to the countries with which it shares historical trade links and that can be easily integrated into its global value chain. In looking to other markets around the world, the U.K. has increased its exports both to countries with developed economies (those where the tertiary sector is already a major component of GDP) and to countries with emerging economies (those where the services sector is growing). Germany and the Netherlands, for example, produce their own services but also provide an important market for U.K. services, even if they have become a rather stagnant market for the U.K. services since 2008. The U.K. has also seen a significant increase in exports, particularly services, to China, the United Arab Emirates, Saudi Arabia, Turkey and Poland. Each of these countries is working to restructure its economy. Although each faces its own specific challenges and must respond to different needs, all of these countries look to increase the importance of their economies’ service sectors. Cultivating these markets is to the U.K.’s benefit because although these countries are not currently major service export markets, they have the potential to grow. While media reports highlight that the details of how Britain will exit the European Union are not yet known, we do know an important fact: Germany needs the U.K. market more than the U.K. needs the German market. This suggests that a trade agreement is likely and will be relatively easy to complete. Furthermore, trade between the U.K. and continental Europe will continue as it is to the parties’ mutual benefit. At the same time, the U.K. will continue to search for other global markets with which to trade. Additionally, the U.S. is the largest market for British exports and is the U.K.’s most important strategic ally. The U.K.’s most important relationship is with the U.S. because London needs the United States to secure maritime trade routes. This supports the U.K.’s exit strategy, which is especially important given that the EU is fragmenting. There was much predicted doom and gloom surrounding Brexit. In reality, however, the U.K.’s trade patterns have been shifting for quite some time, and this change was accelerated by the 2008 economic crisis that further reduced continental Europe’s already diminishing attractiveness for British exporters. While there may be downsides to Brexit – technicalities related to the bilateral trade relationship between the U.K. and continental Europe will likely be different than they were when the U.K. was an EU member state – they will be marginal. Additionally, Brexit will present some opportunities. The U.K.’s economic dependence on the growing services sector has already moved the U.K. away from the European market to seek other trade partners. A Britain free of ties to the EU could take advantage of its historic trade empire tradition and grow its global importance once again. — Brexit’s Impact on the UK Economy originally appeared at Geopolitical Futures.